The Intelect Transport Ultrasound unit offers a new dimension in portable ultrasound. 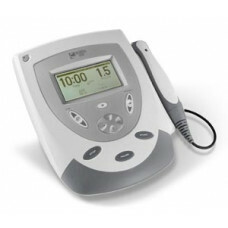 An excellent portable Ultrasound unit for the Physical Therapist or Athletic Trainer on the go. The Intelect Transport Ultrasound features user defined protocols to customize any ultrasound application to your specific needs. This highly portable ultrasound unit features an innovative case design, logical control system and large, easy to read LCD display. The repositional base allows the Transport Ultrasound to be used on desktop or wall mounted. Ergonomically designed ultrasound applicators available in 2cm, 5cm, 10cm,and new 1cm applicator for hand therapy. The optional carry bag is specially designed to protect and transport the Intelect Transport Ultrasound unit and accessories.